Hailed by many fans and critics as Japanese animation's successor to Hayao Miyazaki (Tonari no Totoro; Howl's Moving Castle; Spirited Away), director Makoto Shinkai (The Place Promised In Our Early Days) presents what Anime News Network described as his "most mature and complicated work yet," 5 Centimetres Per Second (Byôsoku 5 senchimêtoru), which comes to DVD in March featuring a brand new audio dub produced by Bang Zoom! Entertainment. 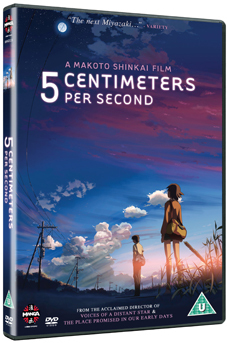 Taking its title from the speed at which cherry blossoms fall, 5 Centimetres Per Second comprises three interconnected short stories, each centred on the hopes and dreams of a boy named Takaki Tono, beginning in the 1990s and end in the present day. The story begins when a new girl, Akari Shinohara, transfers to Takaki's elementary school, the two very quickly grow close to each other due to their similar interests and personalities and are soon inseparable. That is until Akari's parents have to move because of their jobs and, inevitably, have to take their daughter with them. The two friends remain in touch by letter but, despite their mutual affection, they begin to drift apart. When Takaki is informed that he and his family will also be moving even further away, he decides to take a trip to visit Akari and reveal his true feelings to her. Captivating animated and boasting simple, heartfelt storytelling, Makoto Shinkai paints a vivid tableau of young love, desire, loss and hope to stand alongside the works of Satoshi Kon (Paprika; Millennium Actress, Paranoia Agent), Mamoru Hosada (Summer Wars; The Girl Who Leapt Through Time) and, of course, Hayao Miyazaki.